Do you have twins or triplets? 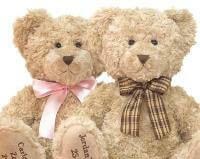 Order now and enter either the discount code: TWINS or TRIPLETS to receive a $5 discount of each bear. This is a permanent discount for any orders made for twins and triplets. And congratulations to our Facebook winners – Stacy Evans has won two My Birthday Teddy bears for her twins and Ali Mountifield will also receive three two My Birthday Teddy bears for her triplets – just for leaving comments on our Facebook page. Thank you for all your beautiful comments about your much loved multiple children. Visit our Facebook page below for our latest competitions and news. Also make sure that you visit www.amba.org.au – a fantastic resource and support for any parents of multiple births.